Editorials from Theslowlane: Would a shorter workweek be good for the economy? Would a shorter workweek be good for the economy? Unemployment too high? Doesn't it make sense to distribute the work more evenly? While some people work full time and even overtime, others can't find a job. Would't it make sense to hire more people and relieve the load on the over employed? Sounds logical, but it also depends on the reasons for the economic downturn. I've been an advocate of a shorter workweek for years, but I just had an interesting epiphany. Reduced work time makes a lot of sense if the downturn is based on environmental limits to economic growth. For instance, if there is a limited amount of work to go around due to things like shortages of water, energy, fish or timber. Then it makes sense to spread the limited work more evenly. On the other hand, economic downturns might also be blaimed on weak market conditions. Basically this would be people not having money to buy enough products and services to maintain a reasonable level of employment. If this second situation is the case, then shortening the workweek might only exasurbate the problem. People who work less earn less money, thus leading to even softer consummer spending power and then even higher unemployment. Both situations, as well as other factors, can lead to economic downturns. In some cases, the shorter workweek seems like a great idea, while in others, maybe not. In the case of economic problens caused by environmental constraints, reducing work hours makes sense. It allows more folks to be gainfully employed in an environment of limits. For those who are now working too much, a shorter workweek can lead to significant improvement in the quality of life. Workers could have more time for family, friends, volunteer activities, excersize and even rest. It can be seen as a way to improve the quality of life without having to expand economic production. More free time works, of course, if people can afford their rents, mortgages and other living expenses. Things like bubbles in the price of housing tend to sabotoge this concept. "Working less, consuming less and living more fully" doesn't sound very appealing if one cannot afford the rent. Of course downsizing to smaller residences can work, but even rents, or mortages for tiny spaces can be a high percentage of one's income in some locations. Seems like the thinking for a shorter workweek would be a good way to deal with the worry about economic growth harming the environment. Maybe we can still grow and progress toward a higher quality of life by just figuring out how to give people more free time. Hurray for the 3 day weekend. Civilization can still move forward. It just has to progress toward more quality of life rather than greater consumption. Seems like preserving the concept of progress is important to most people, including myself. Who wants to just stagnate? Of course some folks would say that environmental constraints on the economy are not absolute. The economy does find ways to substitute and do business even when limits are reached. For instance, rather than constrain oneself with limits on natural fisheries, just build fish farms and grow a lot more salmon than was ever available before. More than a few environmentalists will cringe here. But still, the world is full of examples of new technologies and innovations that allow economic output to continue growing inspite of perceived limits. This factor also tends to make the shorter workweek a less popular idea among more than a few economists. Still, I like the idea of having more time. It's a quality of life issue. Having more time is a way to improve the economy without necessarily having to always grow the economy. 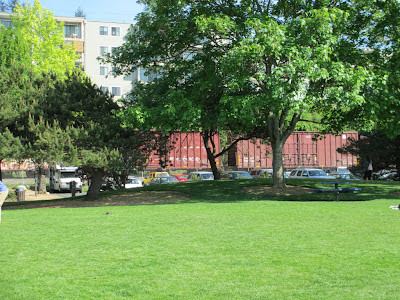 Freight train going by as I write this blog post on a sunny day in Boulevard Park. When the downturn is related to soft markets, rather than environmental constraints, a shorter workweek could be seen as exasurbaing the problem. Paying folks even less money to participate in the market. I just read that California is asking many of it's state workers to cut back to a 4 day workweek. Why? To conserve, not the environment, but the state budget. Seems like fiscal conservatism and environmental conservation have some things in comon. Limits. In the case of the state budget, it's a limited amount of money. Limits inspite of the fact that less government spending can put a damper on economic growth as state workers are a big part of the market that shops in private business. When there's a shortage of revenue, states can't just print money. In the long run, states have to balance their budgets. The Federal government, and the Federal Reserve banking system can print money; so to speak. This gets into the arguements about fiscal stimulus versus a more "low growth" approach. We can print money, but there is the downside that printing money can lead to inflation. Should we not worry too much about future inflation and print money to put people back to work? Are we too worried about deficits if the downturn is caused by anemic consummer spending? A similar question could be ask if the downturn is caused by environmental limits. Are we too worried about harming the environment so we kill too many projects that create jobs? Another question to ask is this. Are there ways we can use new technologies and business practices to create jobs in spite of various limits? And finally, why are we trying so hard to create all these jobs and all this consummer spending. Wouldn't a lot of people be better off with more free time? These are questions that there are no definate anwers to. It's good food for the discussion, however. Some employers will say that they must give some workers overtime, even in a soft economy. They would say that there is no one else readily available to do the job who has the needed amount of training and credentials. This is when there is too much work that needs to be done; like a construction project that needs to hurry and get the job done on time. Would my shorter workweek philosophy sabotage their business? Not really, simply because I wouldn't advocate legislation requireing a shorter workweek. In each situation, people and their employers, need to work out what is best for their given circumstances. Problems happen with "one size fits all" solutions. One size fits all as imposed by governments, or even businesses for that matter. Rather than proposing legislation, I just wish to have good discussion. It's good to have conversation about the various balances between work, free time, preserving the environment and even preserving the budget. Downsizing and reducing the workweek doesn't get enough airplay. Aside from legislation, discussion can help to progress human culture. Let's be less productive. Interesting article in New York Times that someone brought to my attention. Discusses shorter workweek, but suggests another approach. Slowing down at work and going for quality rather than quantity of output. New York Times article by a Tim Jackson, professor of sustainable development at the University of Surrey and the author of "Prosperity Without Growth: Economics for a Finite Planet."